When I was much younger I was left speechless when I saw the laser cannons throwing beams across the screen with Luke and Darth feeling the force. Today I can do basically do the same thing minus the “Force” and “unrealistic laser explosions” with a setup in my home for around $200 from LaserLyte all while becoming a faster and better shot. The company was founded in 1987 and has had a storied past starting as Tach Star then merged in 1996 with Lyte Optics to form LaserLyte. From that point, the company has been creating one innovation after another which has now evolved to include a vast array of laser gun sights, laser bore sights, and laser training systems. For LaserLyte, bringing together the boresighting and laser projection into a training system has been a natural progression. 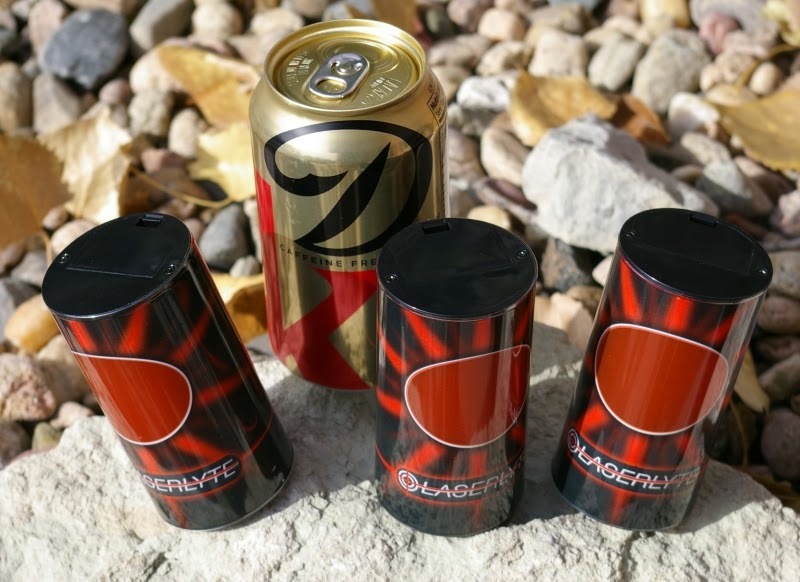 The technology found in the Reaction Tyme Trainer Targets, Laser Trainer Target and now Target Plinking Cans are pretty sophisticated, but LaserLyte’s execution delivers an elegantly simple package. 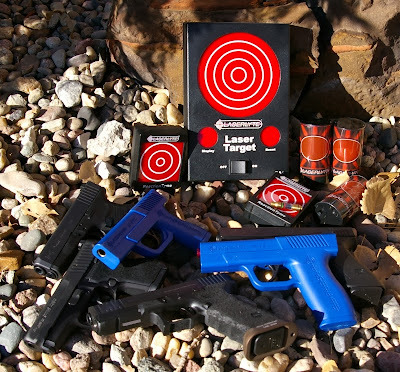 After batteries are installed in the two targets, pop a laser insert into the barrel of an unloaded firearm and you can start blasting the Training Targets of your choice with your real firearm or LaserLyte’s Training Pistol. To utilize the LaserLyte training system, you need two products, both LaserLyte targets and either a laser insert which are both purchased separately based on your firearm's caliber. Previously I reviewed the Reaction Tyme Trainer targets and loved what they delivered for indoor shooting fun and training on rainy, cold, and blistering hot days. Initially I picked up Universal, 9mm and .223 laser inserts for my guns and have used them to fight boredom, and imaginary invaders (not Darth), zombies, and plain old defensive training. The Reaction Tyme Targets delivered a tremendous around of real world training and a bit of fun, however I wanted to try out other targets for a bit different training experience. All of LaserLyte’s produces are made well with high quality castings and I have yet to break or wear out any component with the exception of the Universal adapter I had some problems with. Apparently I had a wonky Universal adapter that worked when it felt like it. After explaining the problem, their customer service swapped it and my performance impressions changed drastically. A tip that was also shared by LaserLyte’s customer service was to save the blue clear plastic insulator shipped installed so the batteries do not run down and use that tiny fleck to save battery life when not in use instead of uninstalling the batteries. This Time Around - I picked up a Laser Trainer Target to show the accuracy of each hit and LaserLyte’s new Target Plinking Cans to add a little fun and difficulty due to the size. LaserLyte also created two Training Pistols for use with the Universal insert to allow for fast realistic repetitive shooting. Now I can execute double and triple taps with a shape that closely emulates most semi-auto pistols. Laser Trainer Target - The Reaction Tyme Targets beep/buzz/flash when they are hit, however if you do not see the laser splash/hit, then you really do not know where you hit and is a target designed to improve your reaction time and speed. The Laser Trainer Target conversely is more like a dartboard designed to help improve accuracy and trigger control by recording all of the hits on the target as they stack up and then display them once you shoot the “display” area on the target. 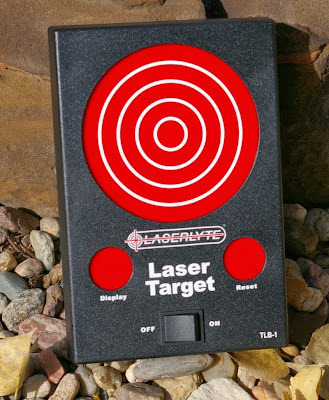 The Laser Trainer Target can be reset simply by shooting the “reset” area on the target. 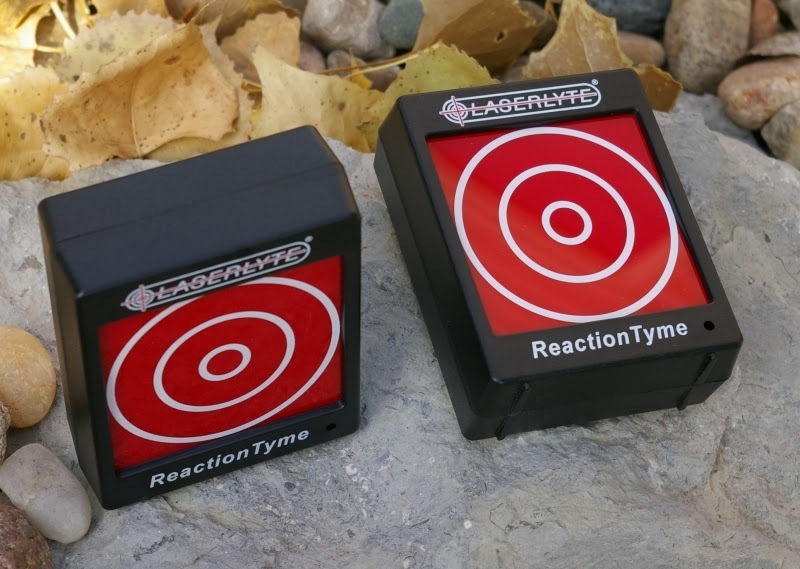 The other important feature is the size which is 9”x6” vs the small 3”x4” Reaction Tyme Targets which makes it easier for beginners to train on at distances all the way across the garage or basement. It is a simple working target that delivers something unique from a training perspective to review accuracy. Target Plinking Cans - We all love to plink at cans when we are at the range and mainly because they tip and move when they are hit. If there is a technology that is most like Star Wars it is embodied in these Target Plinking Cans. Shoot one of the cans with a solid hit on the small 2” target area on each can and they flip over. On the first hit and flip you are hooked because lasers tipping over cans is just cool. It also feels very real because beyond a weird clicking sound you see the laser hit/splash on the can it the can physically flips over. The Red Bull sized LaserLyte cans are 9V powered with a pin that pops out when the target is hit which tips over the can. Great idea that works well except in bright sun drenched rooms where the cans auto trigger thinking the bright light is a hit. I also had a problem with some bright overhead lights giving false triggers as well. In most cases the Target Plinking Cans worked well though delivering a lot of reactive fun. Of course you still need to walk over and reset the cans after each hit, so if you are lazy the Reaction Tyme targets may be a better option. 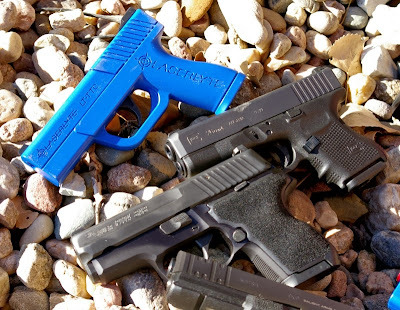 Training Pistols - Compact & Full Size - These are essentially a standard size and compact sized blue plastic analog of a semi-auto pistol that clicks loudly when you pull the realistic feeling trigger. The click is to set off the required (but purchased separately) Universal Laser Insert which is triggered by loud sounds and vibrations such as the Training Pistol clicks generated each trigger pull. 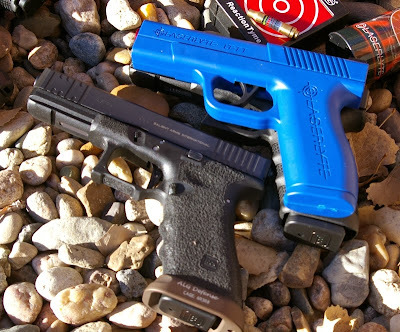 Honestly you feel like an idiot paying $50 for a blue clicking pistol that still requires a $120 LT-Pro Universal laser adapter to really do anything useful with your LaserLyte targets, however after you rip the Training Pistol from your waistband and then run through your house shooting your two Reaction Tyme targets, three Target Plinking Cans, and finishing with three hits to the Laser Trainer Target the $50 slips your mind in a hurry. My initial feedback to LaserLyte was to integrate a laser into the pistol, however then you realize that you can pull out that LT-Pro and use it in almost any pistol you have. The full/standard size is a great analog size and shape. The compact’s handle is a little small, because there is no known semi-auto pistol handle in the world that small, however it is a stunning kid hand sized trainer which I think was the right decision. In most cases I would stick with the standard size for adults. The last I checked, the weight of in-stock .22LR ammo crushing shelves is not a problem so we still need to find other ways to train inexpensively. Lasers are very cheap to shoot. Inserts shoot about 3000 shots per $8 set of hearing aid batteries. 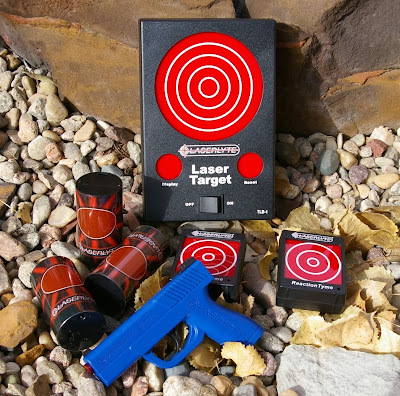 This professional level system delivers a complex and usable training experience that makes you a better shot, improves reaction and even delivers a huge dose of fun in the process and of course shooting lasers around the house makes you feel like Luke all over again. Weight: 12.75 ounces / 362 gr. Weight: 10.4 ounces / 295 gr. - Range of Usage: 50 yd. I have my laserlyte about a year ago. I don't even use that much. the blue pistol still emits laser light as it can be seen when I hit the target, display and reset. but after shooting the target and hitting the display, no light is being displayed. i did it several times: reset, hit the target, display. but it doesn't display my shots. what's wrong? i also changed the target's 3 AA batteries with a Duracell but still it doesn't display. I would reach out to LaserLyte. They have had great customer service from my experience.